Today, I am writing to you a review I didn’t want to. 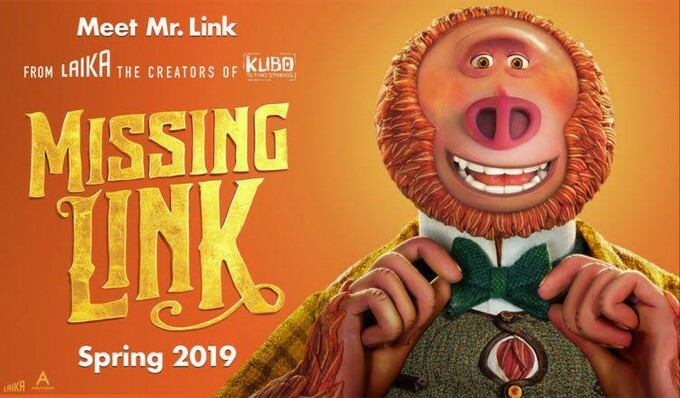 As a long time fan of the studio LAIKA, a studio which has brought back stop motion animation in such a big way, I am sad to write about my real feelings about their newest film MISSING LINK. 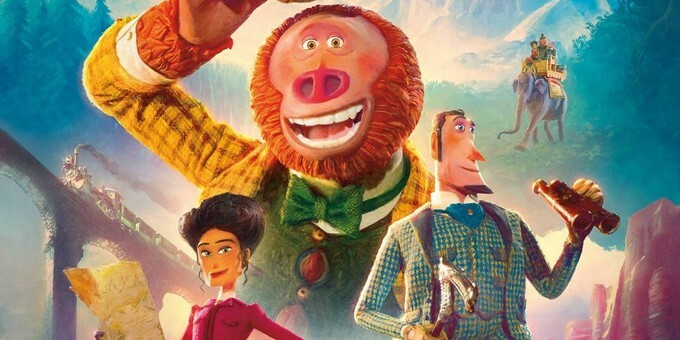 With my standards for an adventure story held up to their previous works (which I will often be comparing this film to in this review), CORALINE and KUBO AND THE TWO STRINGS: I regret to say that MISSING LINK passes off as barely okay. The story follows Sir Lionel Frost, played by Hugh Jackman. He is a selfish explorer who seeks to create a sort of legacy with his discoveries of mythical creatures. Frost receives a letter from someone saying they can help him find Sasquatch in the Pacific Northwest. With no way to confirm whether not this letter will lead him to Sasquatch, he tells the club of mustached elite gentlemen that he is bringing back Big Foot. After they laugh at him, Frost, who is desperate to join their club, makes a wager with the leader that he can bring back the creature and join their ranks. Frost follows his lead and finds that it was the Sasquatch (later named Susan) himself who invited him to find him. Susan reveals that he has been alone for many years and wants Frost’s help to see his potential cousins, the Yeti. Frost agrees, and they set out on an adventure to find Susan’s lost family. MISSING LINK has a lot of excellent ideas that were not well executed or fully utilized. Every time it seemed like something cool or interesting was about to happen, it didn’t. Especially when it could have tied into some legit character development, which leads to another problem, this movie highlights LAIKA’s storytelling weaknesses that otherwise wouldn’t be noticed at all and/or easy to look past, the characters are very weak and mostly unlikeable. CORALINE and KUBO did the adventure story well not just because of their characters’ struggles, but because there were a lot of great visuals, and very interesting sceneries, cool creatures, and events happening that kept the ride going, and the viewer was having too much fun to notice the lack of concrete character development. 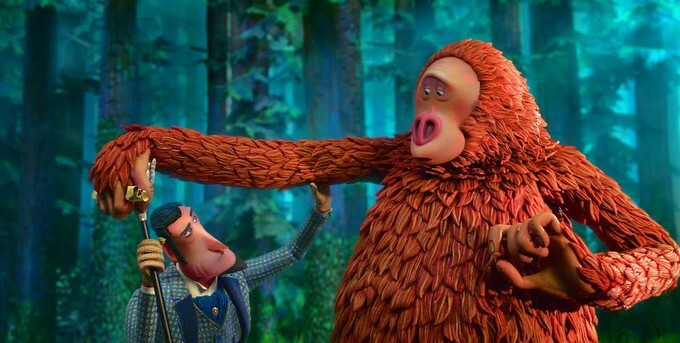 In MISSING LINK, things just aren’t as fun, and you’re left with this bad taste in your mouth of these characters that are almost fully developed. This made it rather frustrating that the characters were just on the verge of the third dimension. Lionel Frost is established as a selfish man who only seeks to further himself and his explorations. He burned the female romantic lead Adelina Fortnight (Zoe Saldana) severely enough to marry his now expired best friend instead of him. Opportunities arise for the character to grow and change, and he does. But, it is done with very little convincing or reason to change. Sure, he was forced to consider someone else’s feelings only after being yelled at, but it felt like it more so happened just to move the plot forward than it did naturally. Frost is kind of given a past with Adelina, but I didn’t feel like it was quite enough for us to get to know him. I can hardly talk about Adelina because it seemed like she was there only to build Frost. She has kind of a personality, but we mostly see her just being angry at Frost for being stupid. Sometimes the villain can carry or make a weak main character into something good, but sadly that wasn’t the case either. Lord Piggot-Dunceb, the main villain, played by Stephen Fry, is hardly a likable villain. Frost’s rival in the wager he has these manbaby tantrums that are just cringey to watch. There isn’t really much motivation given to his behavior beyond pure bigotry and human centristic ego, and he is so much of this, he made the climax of the movie not very fun either. Stenk, a side villain who is a hitman, I think was probably more developed than the main villain. Perhaps if they had combined Lord Piggot-Dunceb with Stenk somehow, it would have created a more complete and compelling antagonist for the story. Mr. Link/Susan (Zach Galifianakis) was relatively likable. He was literal, and sweet, and probably loveable if we got to know him better. You wanted him to find his family, and any non-robot can understand that motivation. This is hard to talk about without spoilers and being clear, but at the point of revelation in the hero’s journey, he doesn’t really seem to quite react to bad news as he should realistically, which this would have been a great opportunity to really feel the character, but it just didn’t quite get there. I really would like to say more about it, but I’m not giving anything else away. Hopefully, I didn’t say too much. Come to think of it, the fact that I’m not willing to just spoil the movie says something. When I hate a movie, I’ll just let it all loose, but I can’t honestly say I hate MISSING LINK. Even though there is a lot of frustrating points to talk about, it was kind of fun. What else I can say that was good about the movie was the animation and art was for the most part: great. I noticed throughout the film that the “weight” of the characters seemed off, and I dismissed it because it was stop motion. But later there is a scene where they have up to four people hanging from a single ice pick, and no one seems to be “struggling” to hold on except for the person holding the pick, even though there are around 1000 lbs of weight pulling down. Although they were fighting gravity not to fall, it didn’t really feel like it. I left the theater both disappointed and frustrated because I wanted to love this movie. There was a good cast, good writers, good ideas...but this movie wasn’t. 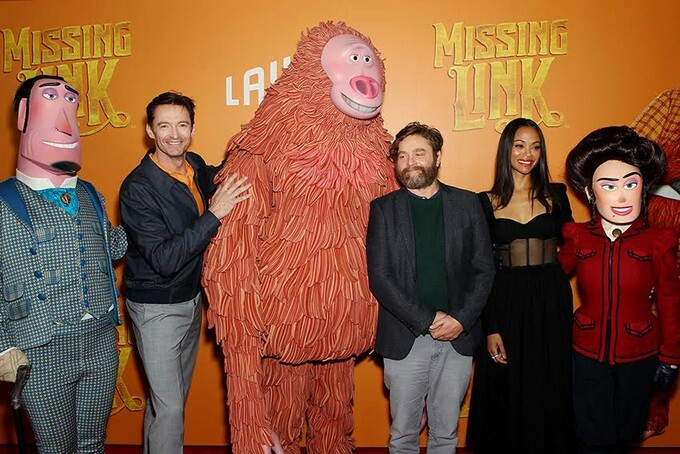 I can only imagine the kind of problems they had behind the scenes making MISSING LINK. As a parent being dragged to this movie, you’ll find it tolerable to okay. Kids will have fun. As an animation aficionado, this just wasn’t what I was hoping for. 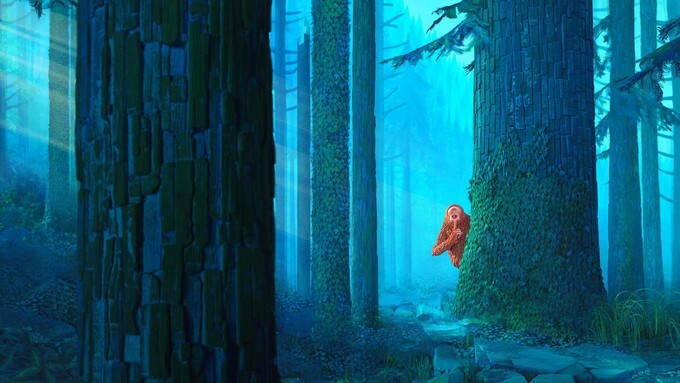 I compared MISSING LINK to CORALINE and KUBO a lot, but only because they did the hero’s journey right, and used their own great LAIKA elements that made it their own. Not every creation that comes from a great artist is going to be pure gold or exactly like the others, but that doesn’t also imply that there will never be good original work coming from them ever again. I look forward to LAIKA’S next project, and I hope you will too.